This was the most distinctive child seat I’ve seen in quite a while. Last week I wrote about packing two children on a folding bike (arguably inappropriately). Evidently this is my week for spotting ad hoc child seats, because parking at the office I saw another one. This rider put a seat cushion/saddle (?) on the rear rack and hacked a piece of pipe as a footrest onto the rear wheel. Although this is a normal-sized bike and the frame itself is probably fine carrying more than one person, I have to wonder whether the rack is really rated for the weight of a kid old enough to sit without a harness or back rest. 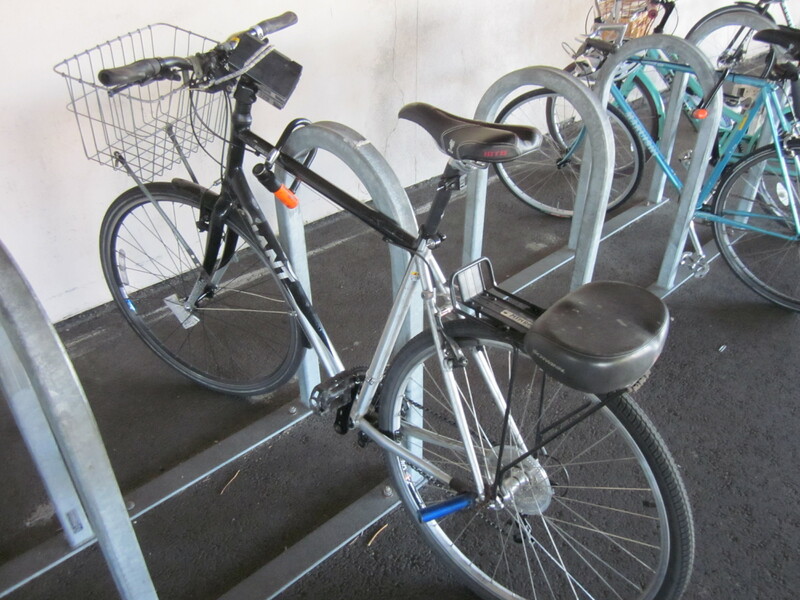 What amused me most about the setup, though, was that the owner of the bike had carefully locked the scavenged seat and the “I sawed off a piece of aluminum tubing” footrest to the bike with old bike chains. Finally I have spotted a rider who is even more ridiculously paranoid than I am about bike theft. Maybe I’m living dangerously, but dude, I think the footrest is safe from tweakers. Some people need to give more thought to their kids safety. That rack isn’t rated for more than 40 lbs. tops. OGK’s one is the best considering, its price, utility and safety. Okay, David P. that is uncalled for. I do not beleive that any parent in the world who is going to go to the effort of putting together a custom seat for their kid is not giving thought to their kid’s safety. You know nothing about this family except that you’ve seen a picture of their parked bike on the web. I appoligize if I am taking an argument I am having with the rest of the culture out on you. I’d just love to see us put a stop to the “your doing it wrong” concern trolling. Perhaps David P.’s framing is a little blunt, but I would not put my child on that seat, and I would be angry if a friend or parent put my kid on that seat. If you’re hauling around a sack of potatoes then it don’t matter if your “doing it wrong”. When your hauling another human entrusting you with their safety, then yeah I think a bit more judgement needs to be exercised. It’s obvious from the picture that the rack in question is the lightest model (MTN-1) Blackburn makes with two struts of thin gauge aluminum tubing rather than a three strut model with heavier guage tubing. So yeah, I stand by my original comment. Sometimes “it ain’t all good”.